Back in 2003, the committee decided to organise a scheme to raise funds for the association. All monies raised are split 50% to the club, and 50% in prize money - hence the name 'Tiddler's 50/50'. For a one-off yearly fee of just £5.00, participants (members and non-members) are automatically entered into 6 draws throughout the season. The prize money is split equally for the 6 draws, which will be drawn by a non-committee member at the monthly committee meetings. Oliver Burch from Gloucester with a cracking 8lb 7oz sewin which won him the 2006 Night Competition on the River Loughor. PAA run a number of competitions throughout the season. River Loughor - to be confirmed. Day Competition, River Loughor - to be confirmed. River Teifi - to be confirmed. Local reservoir (usually Llys-y-Fran, near Haverfordwest) - to be confirmed. This event is usually supported by the Pontarddulais Town Council and is therefore free to under 16's. 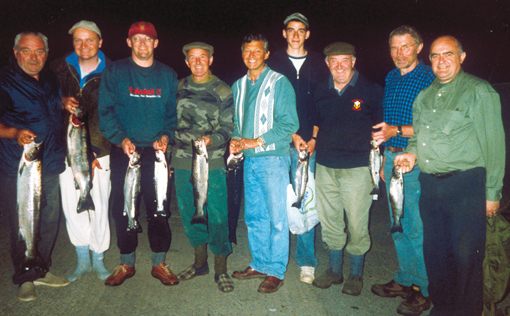 Night fishing competition – River Loughor 2005. 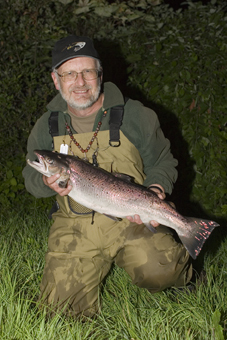 Brian Collins (far left) 1st place with a salmon of nearly 9lb. Lyn Davies (second from left) 2nd place, with a sea trout of over 7 pounds and Barry Davies (middle) 3rd place, with a sea trout of over 5lbs. All fish taken on the fly. Great night!